Denzel Washington and Chris Pine star in the new Tony Scott-directed thriller "Unstoppable." 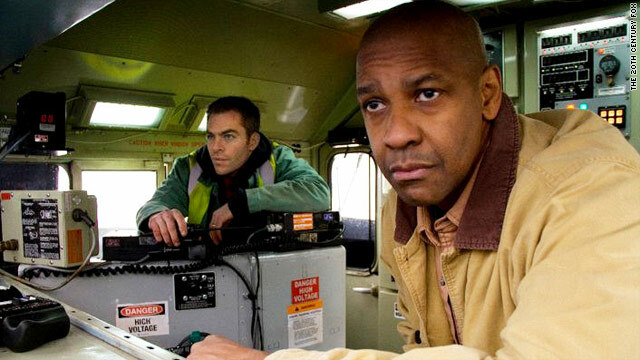 Denzel Washington and Chris Pine play engineers in the new film "Unstoppable"
(CNN) -- On May 15, 2001, a locomotive pulled out of Toledo with 47 freight cars, thousands of gallons of hazardous materials, nearly 3,000 gross trailing tons, and not a soul on board. The engineer was "nearby" at the time, according to a CSX spokesman. The train went unchecked across three counties, for 66 miles, picking up speed as it traveled. Sometimes, life gives you the movie on a plate. Not that this stops Hollywood from gilding the lily. CNN reported at the time that the train averaged 30 to 35 mph and peaked at 47 mph. When a daring engineer finally managed to jump aboard, it was traveling at a not very cinematic 10 mph. Let's just say that's not how it plays out in Tony Scott's hokey but hugely entertaining big-screen version, "Unstoppable." In this film, even stationary trains seem to be going faster than that. No surprise there: This is the filmmaker who gave Tom Cruise "the need for speed" in "Top Gun." While older brother Ridley has a tendency to pump up productions like "Robin Hood" and "Body of Lies" to the point where they can barely move -- a director famed for his compositional eye has real trouble judging scale -- Tony Scott consistently turns out glossy productions with B-movie virtues: snappy, unpretentious and, above all, swift. I'm not sure if Tony has any compositional sense at all -- in movies like "Déjà Vu" and "Man on Fire," he's constitutionally unable to hold a shot for more than three seconds -- but he never forgets the first rule of filmmaking: Don't be boring. "Unstoppable" is his second train movie in two years, and a marked improvement on the stuffy subway thriller "The Taking of Pelham 1 2 3." As usual, he's brought his favorite working-class hero, Denzel Washington, along for the ride (this is their fifth collaboration). Washington is Frank, one of two engineers who find themselves on a collision course with the runaway. The other engineer, Will, is played by Chris Pine. Despite orders to stay out of harm's way in the nearest siding, the take-charge veteran and the distracted rookie elect to risk their lives. Scott and screenwriter Mark Bomback ("Live Free or Die Hard") take the story to the next level -- the fast track, you might say. No coaster, this loco gets upwards of 70 mph and smashes through anything that happens to stall on a crossing. Scott doesn't quite stoop to tie a damsel to the tracks, but I'll bet he thought about it. Horses and even a party of kids on a school trip to learn about railroad safety (oh, the irony!) are wheeled in front of the onrushing engine for sport. Washington and Pine flesh out their roles with minimal fuss. Scott leans a bit lazily on overly informed, up-to-the-minute news dispatches to keep jogging the tension; "Unstoppable" might have been even more exciting if he wasn't always trying to force the pace. But no two ways about it, the movie keeps us hooked.